Our roundup of cheap bar food this month includes one of the best burgers in Ballard for $10 and some happy-hour dumplings in Bellevue. 500 Bellevue Way N.E., suite 210, Bellevue; offers happy hour weekdays 3-6 p.m. and on weekends 3-5 p.m. and again at night Monday-Thursday 9-11 p.m., Friday and Saturday 9 p.m.-midnight and Sunday from 9-10 p.m. (425- 625-2165, baronsbellevue.com). 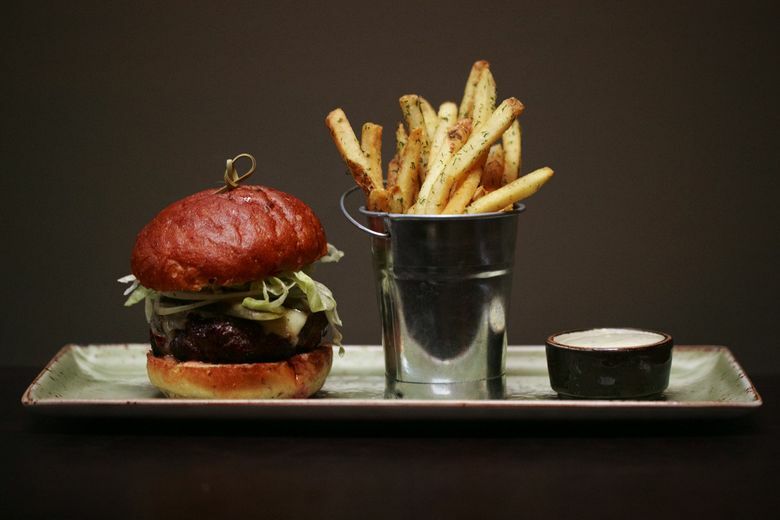 Bramling Cross: Ethan Stowell’s gastropub serves up one of the biggest cheeseburgers in Ballard, with all the fixings and a side of signature pickled fries dusted with fresh dill for $10. It’s a substantial half-pound burger, now available throughout the restaurant during happy hour, even on busy Fridays and Saturdays. Before, the happy-hour menu was offered only at the bar. Other happy-hour items to check out: wings, beer tartare, poutine and some $8 cocktails. 5205 Ballard Ave. N.W., Seattle; offers happy hour daily 5-7 p.m. (206-420-8192, ethanstowellrestaurants.com). Rider is the slick downtown restaurant inside the Hotel Theodore in Seattle. It’s a seafood happy hour, with snacks such as smoked trout fritters and Dungeness crab scotch eggs. Don’t miss the crab butter served with hot bread. It’s an evil, evil spread. Raw oysters start at $1.50 at 3 p.m. and increase by 50 cents every hour, capping at $2.50 at 5 p.m. For those allergic to seafood, there’s the $9 happy-hour burger. 619 Pine St., Seattle; offers happy hour 3-6 p.m. daily and again 10 p.m.-midnight (206-859-4242, hoteltheodore.com). El Grito: This popular Mexican lunch spot is one of the few that serves food after midnight in South Lake Union. Its late-night food menu is identical to its evening happy hour: $7 nachos and three tacos for $5-$6. 234 Fairview Ave. N., Seattle; offers happy hour Monday-Saturday 3-6 p.m. and late-night menu from 10 p.m. to 1 a.m.; closed on Sundays (206-659-4552, elgritoseattle.com). Mr. Darcy: This Belltown bar, named after Jane Austen’s character in “Pride and Prejudice,” debuted last summer in the former space of Clever Bottle. It’s been under the radar despite being on the busy drag of the neighborhood. From the same owners behind Bathtub Gin and Rabbit Hole, Mr. Darcy is one of the few in Belltown where craft cocktails are still $10 and are as cheap as $8 during happy hour. 2222 Second Ave., Seattle; offers happy hour daily from 5-7 p.m. (mrdarcysbar.com).